The Mayor of London, Boris Johnson, has today launched a “major drive” to boost broadband connectivity in the capital, although it’s mostly the same stuff as we saw being announced last year. At least there’s now a map to depict just how bad the situation is, especially in the city centre. But today’s announcement was ultimately all about the launch of two “new” initiatives to help “make the capital the best connected city in Europe” and boost “affordable access to superfast connections for homes and small businesses” (i.e. not just ridiculously expensive Leased Line services). All of this links into the existing London Infrastructure Plan 2050, which wants 99% of properties in the capital to have access to affordable superfast connections by 2018 and hopes to push 5G mobile out into the wild by 2020 (assuming the hardware is even ready by then). Companies and property owners can now register their interest to be part of London’s first Connectivity Ratings Scheme, which will provide tech companies and small businesses with an easy way to identify buildings that meet their connectivity needs and will incentivise landlords to improve the connectivity of their properties prior to tenants moving in. The scheme will be delivered by WiredScore and the Mayor has contributed £50,000 towards it through the London Enterprise Panel. It will also allow property managers to receive a technical assessment by an engineer into the connectivity in their buildings, which can then advise on improvements and provide either a gold, silver or bronze rating. The rating will be listed on a searchable property directory. Next up we have the new Interactive Connectivity Map, which roughly shows areas of both slow and superfast broadband coverage (see below). The map will also allow residents and businesses to register their interest for faster broadband services and show demand from local premises, which should enable the capital’s broadband ISPs to see where there is demand and encourage new providers to target under-served areas. When providers deliver new superfast services to an area, people who have opted in will receive an alert that new services are available. But nearly all of this was already announced last year (here) and so will not come as much of a surprise, although politicians do so enjoy re-announcing such things every 8-12 months. Meanwhile the Mayor has once again invited some of the city’s largest ISPs, such as BT and Virgin Media, to a second Connectivity Summit in order to discuss how to improve connectivity.. again. It’s not known whether this included any of the smaller, yet increasingly significant, providers such as Cityfibre or Hyperoptic etc. But one of London’s biggest problems is that, much like other cities, EU state aid rules currently prevent public money being spent to improve general broadband infrastructure. This occurs because it is understandably assumed that the private sector should have no trouble in making the case for investment. Mind you BT still sometimes struggles with this concept, especially when faced with the dreaded Exchange Only Lines (EOL) problem, although they are conducting trials of various solutions like Fibre-to-the-Remote-Node (FTTrN), Fibre-to-the-Basement (FTTB) and G.fast as well as other potential fixes. Meanwhile we shouldn’t forget that Virgin Media has recently committed to extend their ultrafast cable network to an additional 4 million premises (60% UK coverage) by 2020 (here), which will predominantly be focused on expansion in urban areas. Not to mention all the efforts by Hyperoptic to link up apartment blocks via FTTP/B. In other words it appears as if London’s slow-spots will eventually be closed, although whether or not that 99% goal is achieved for London by 2018 remains distinctly less certain, but at least the cancer of slow connectivity is in a very slow remission. Now here’s that map, just don’t be surprised if it almost completely overlooks altnet ISPs, be they fixed line (Hyperoptic) or wireless (Relish).. He could at least suggest a new planning condition on all re-furbs and developments to offer fibre access. He could also encourage councils to lay new duct where BT duct has not been maintained, is full, or reserved for private circuits. Since when has a council installed ducts, and who for? Is duct reserved for private circuits? This idea of providing ‘fibre access’ needs more detail. Councils can add duct as part of any streetworks activity. If BT does not have the wherewithal to maintain its ducts, then why would councils not consider investing in ducts help BT and other providers on an equal and fair basis. It should be relatively simple to have provision of fast broadband for major developments part of the planning process. It’s already the case that major developments are required to make contributions for improving local infrastructure, like schools and roads. They are also required to deal with issues regarding supply of power, water, connection to the sewage systems and so on. It’s hardly a big step to insist on fast broadband infrastructure. In the big picture of a major development, it’s hardly a massive component of cost. It should be noted that this is not an issue limited to telecommunications. For instance, a large development can require major investments in the power infrastructure and there are ways and means by which this is dealt with. @NGA – I was asking for actual examples of councils installing ducts for telcos to use. BT fix many blocked ducts so not sure what your point is. Considering how much income BT gets from urban areas it is a scandal why the infrastructure hasn’t been updated. If they can afford to waste money on content aka emperors new clothes, they could afford to lay more fibre. They are slowly killing the golden goose, and will hand the carcass back to the government once they have filched all the golden eggs. That is what happens when you let a monopoly rule the roost. Can we have that in English with a detailed explanation and financial details. Back to your old routine here, aren’t you? The figures are to come by with a simple Google search. @GN – please provide a link in the same way as many documents have footnotes giving the source. ‘They are slowly killing the golden goose, and will hand the carcass back to the government once they have filched all the golden eggs’. Typical CC nonsense buzzwords again with no willingness to discuss. People with MBEs do not have to lower ones self to your standards obviously ;). Alas, TheFacts never comes up with own thoughts, all he does is asking the same lame questions, yet he refuses to do anything about his own miserable broadband situation. He wouldn’t even mind if the government were to fund an expensive nationwide fibre-broadband. The UK broadband farce is by and large a result of failed regulatory frameworks, wrong government policies and an incompetent near-monopoly telecom like BT. Well he and a couple of others certainly seem to have a unhealthy obsession with Chris anyone reading would think he is some kind of spurned love interest the way he carrys on. Maybe it is just good old pure simple jealousy. Shouldn’t the parks have be marked up in another colour, so as to differentiate real slow areas from green spaces? Southwark Park apparently has a mixture of Fast and Superfast broadband. Maybe I should buy a tent! You have to question the accuracy of the initial data. Rotherhithe, a well known ‘not spot’ in London with the majority of the 12k residences on exchange-only lines is showing on the map as having ‘Fast’ connections (10-30Mbit download). 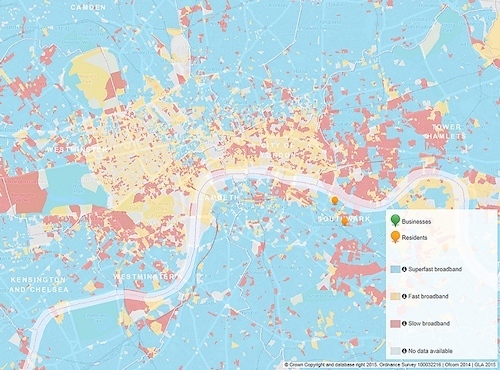 Southwark Council commissioned a recent report showing that the majority of Rotherhithe has ‘Slow’ connections (2-10Mbit download) with almost 1k homes with broadband less than this. If you want to know where Rotherhithe is look for the mass of orange dots on the map! It amazes me that broadband is so bad in our capital city. BT profits for the year to 31st March were £2.6 billion. One role of Ofcom is to ensure that superfast broadband coverage is improved. Clearly the capital is available and Ofcom should be ensuring that it is spent. Why then is broadband so bad in London? 7 out 10 private circuits are sold to solve a broadband issue due to distance. Profits are certainly high. Other telcos have been providing services for 30 years, why not for you? @NGA are you seriously suggesting that 70% of circuits are bought because NGA/DSL is a issue??? I’d like to see a link to that research. So why don’t you use one of these other telcos to improve your miserable broadband situation rather than asking the taxpayer to pay for it all? @GN – my own broadband situation is lovely, no problems. That being the case, there is no need for you posting these lame questions. There is nothing to prevent you from doing some of your research. E.g. how about coming up with a solution for the slow broadband areas in London? Without wasting taxpayer’s money. I love it how 10 Mbit is classed as “slow broadband” when there are thousands of people much less fortunate than that. This map is well out of date and complete Bullpoo, according the map i have 10-30mbits, i and hundres round here are lucky to get 4mbits. There is somewhere called Greenland Dock that according to the map has slow braodband yet that have just had hyperoptic installed and wondering round there the other day looking at my phone a fair few of the boat owners docked up have it, so the map will come in handy when i run out of loo roll, after all that’s all it’s fit for. The JV between ITS and Hammersmith and Fulham Council to utilise the 17km duct and fibre network should become very attractive to use for this program. There are also several other major London boroughs looking to follow the same concession agreement/ JV model. Except there doesn’t seem to be much of a problem in Hammersmith and Fulham according to this map. So why would a small amount of duct help, what chance is there that it reaches the places lacking service anyway? Looking at the map I was surprised how much of it was blue, especially when you discount some of the pink shading over parks, I’m guessing over 90% is blue? Most of the slow spots are towards the centre, in places like Knightsbridge, Mayfair, Belgravia and the City of London, none of which are exactly densely populated with residents, nor are many of the residents unable to afford faster links if they need them, even if fibre broadband isn’t available. Not a londoner but was 4G included in coverage or was it fixed line connections only? 4G coverage obligation requested by Parliament was 98% of premises with a signal strength capable of support 2Mbps indoors by 2017. Ofcom included 98% but reduced it to 95% by nation and 2Mbps was to measured on a lightly loaded cell. So it is an improvement if its measured and enforced. Been trying to get clarification from the Mayors Office on this but not had an the answer. This map looks something like Ofcom’s postcode data. If so, then it will probably be from around June 2014, with the superfast information coming from Openreach and Virgin Media network information, and the fast/slow 10Mbit/s split based somehow on larger ISPs’ customer connections. Relish and Hyperoptic were probably not included (which might have made a difference in the City or parts of the Rotherhithe riverside).